Weiler Nutrition Communications | New Nutrition Labels are HERE! Are you ready to transition? We can help! New Nutrition Labels are HERE! Are you ready to transition? We can help! 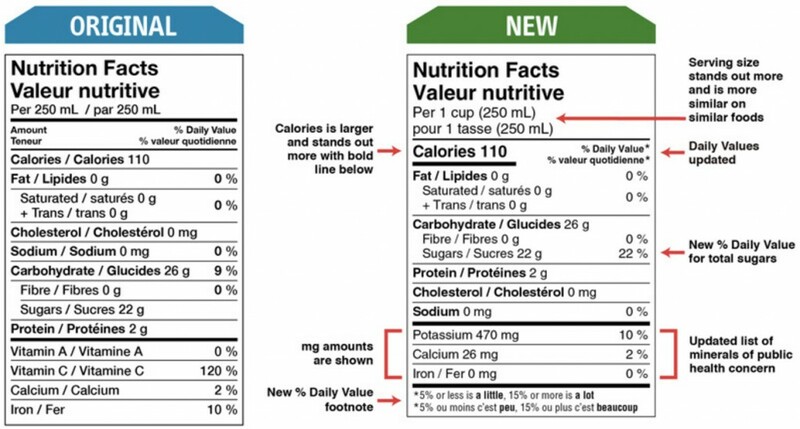 One year ago, Health Canada updated the Nutrition Facts table and ingredients list on packaged foods. This important change is part of the strategy to help make healthy food choices the easy choice for all Canadians. Food makers have until 2021 to transition to the new labels and many of our clients are starting to make the shift. Plan ahead and connect with us to help unlock your food’s nutrition potential and support healthy living for all Canadians. Contact us at: lucia@weilernutrition.com for more information about these label changes and to discuss how the proposed front-of-package labelling will impact your business. This entry was posted in Food Labels, Healthy Eating, Innovation, nutrition labelling, Trends and tagged #sugar #nutritionlabel, dietitian, food, Healthy eating, Lucia Weiler, nutrition. Bookmark the permalink. Previous Post: NEW Front of Pack Labelling Update – 3 tips on how you can prepare for the big changes ahead.